Part 9 in an ongoing series highlighting Northeast-based gear companies. As a follow-up to my recent post on Winter Traction Systems, I wanted to more extensively highlight 32North of Biddeford, Maine—manufacturer of STABILicers. STABILicers Originals also provide users the ability to easily replace worn cleats with the aid of a simple screwdriver or socket wrench and a replacement kit that includes 50 additional cleats ($5.50). STABILicers Originals are designed to fit on a wide range of footwear, from casual shoes to hiking boots, and come in seven different sizes, from XXS all the way up to XXL for size-15 Bigfoots like me. In more recent years, 32North has introduced a series of lighter-weight companion products to their original line, including STABILicers Lite and STABILicers Sport, though reviews seem to indicate these stay less securely attached, especially on steep terrain. 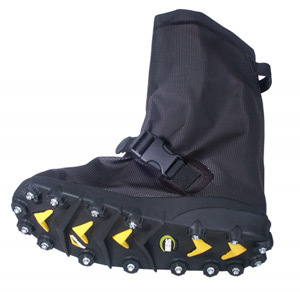 32North also just introduced the beefy waterproof STABILicers OverShoe (pictured) for maximum protection and traction. You can order them directly from 32North , or find them at most major outdoor retailers (find one close to you with their dealer locator).